Uherský Ostroh is a small but pretty town in the Zlín Region in eastern Moravia. It belongs to the Slovácko cultural region, also known as Moravian Slovakia. The inhabitants of this region speak Moravian dialects of the Czech language, but the varieties spoken in Slovácko have strong Slovak influences. Because of the proximity to Slovakia, the culture of the region shares many similarities with the Slovak culture. Therefore, the region was named Slovácko (Slovakia is called Slovensko in Czech). Uherský Ostroh is situated on the Morava river, which is the river that gave name to the region of Moravia. Getting there by public transportation is very simple. There is a train station in the town, with relatively frequent direct connections to Brno, Uherské Hradiště, Uherský Brod and several other towns in the region. If you stay in Moravian Tuscany, Uherský Ostroh might be an interesting day trip and there is a direct train from Kyjov. Uherský Ostroh Chateau is the most important landmark in this cozy Moravian town. It is a former castle, built in the 2nd half of the 13th century. The Šternberk (Sternberg) family, who owned the castle, converted it into a renaissance chateau in the 16th century. Nowadays, the chateau is owned by the town of Uherský Ostroh and is protected as a cultural monument. Náměstí Sv. Ondřeje is the central square of the town. As in many other Czech towns, the central square features picturesque tenement houses. 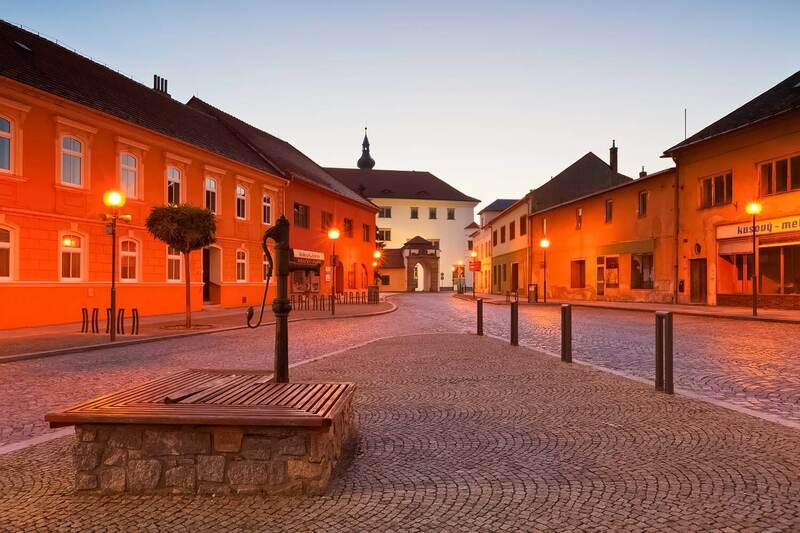 They may not be as spectacular as, for example, the ones in Telč, but they are still a pleasant view, if you like typical Central European towns. The Jewish cemetery in Uherský Ostroh was founded in 1862. There are around 200 gravestones in the cemetery and a further approximately 100 were moved there after the liquidation of an older cemetery in 1954. The oldest of these moved tombstones are from the 16th century. The Jewish community of the town ceased to exist after the Holocaust. The cemetery is protected as a cultural monument. The characteristic arch bridge over the Morava river is also protected as a cultural monument. It was built in 1928. Would you like to stay in Uherský Ostroh for a few days? Relax 21 is a fantastic guesthouse in the very centre of the town, at Náměstí Sv. Ondřeje. It boasts excellent wellness and fitness facilities. Guests who wish to actively explore the region of Slovácko can rent trekking and electric bikes. Check the availability and book your room.